OK, so technically I haven't finished Matched yet. 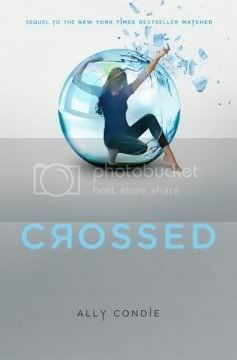 But what I did read of it was good enough to tell me that, as soon as I heard there would be a sequel, I'd want to read it...so here I am, telling the world about HOW IMPATIENT I AM FOR CROSSED TO BE PUBLISHED. Ally Condie is a brilliant writer, and if this book lives up to expectations...it shall be awesome! (Summary from Goodreads.com) In search of a future that may not exist and faced with the decision of who to share it with, Cassia journeys to the Outer Provinces in pursuit of Ky - taken by the Society to his certain death - only to find that he has escaped, leaving a series of clues in his wake. Cassia's quest leads her to question much of what she holds dear, even as she finds glimmers of a different life across the border. But as Cassia nears resolve and certainty about her future with Ky, an invitation for rebellion, an unexpected betrayal, and a surprise visit from Xander - who may hold the key to the uprising and, still, to Cassia's heart - change the game once again. Nothing is as expected on the edge of Society, where crosses and double crosses make the path more twisted than ever.